Young love courses through us like a powerful drug; a dangerous and whimsical cocktail of chaos and passion. While the insatiable highs of affection and joy send us spiraling through bliss, eventually, we crash. We strive to balance the high and lows, drifting between total euphoria and turbulent unrest, all while craving each moment we spend in love. Atwood Magazine is proud to be premiering the music video for “Guava,” the upbeat single from Animal Eyes’ latest studio album Where We Go (independently released 5/20/2016). The album is laced with tracks that connect past relationships and sentiments of loss, often topics difficult for discourse. 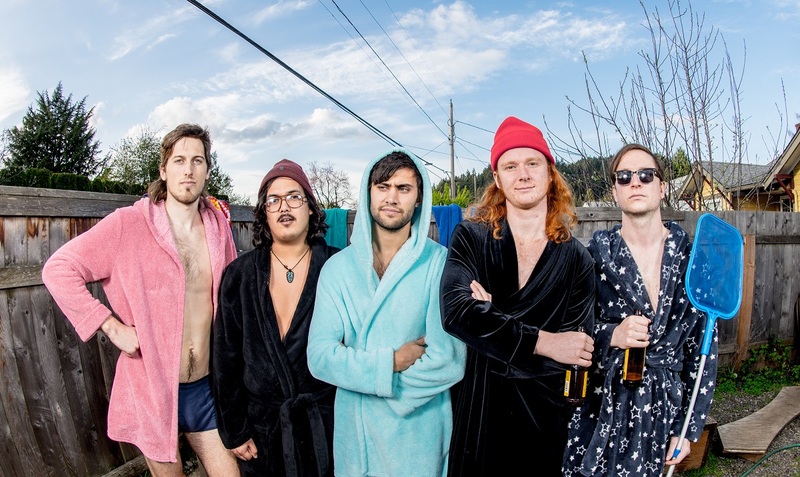 “Guava” itself is a stand out track, crafted with five-part harmonies and catchy melodies. The song opens with fast, animated guitar licks, sending us on a psychedelic trip into the minds of colorful and heartbroken lovers. Lamenting over seemingly unattainable stability, the quintet describe their love as doomed from the start. The subject of their despair? An unnamed but dangerous femme fatale, unabashed and unbroken by the trouble she seems to cause. The chaos is further expressed with steady drum beats as the fast paced and giddy melody contrasts with the lyrics. As the video opens, brightly colored backdrops placed behind each smiling member set a lively mood for the scene. The guitar licks remain prominent elements of the track, flaunting the band’s talent for creating magnetic melodies. The group continues to define the rush and drag of new and impulsive romance, adding layers of dimension with a five-part melody that showcases each members’ distinctly strong vocals. Hands suggestively ascend from the corners of the video’s frame, enticing and teasing the group as they remain unaware of what’s to come. Like the violent nose-dive of an erupting relationship, the video takes a sinister turn as the once alluring hands take turns prodding and poking our smiling protagonists. This may be the most captivating element of the video itself. As the hands morph into close fists, they take turns beating the still beaming faces to a bloody pulp. The viewer can’t help but watch the oblivious, wounded quintet pull loose teeth from their smiles, wiping beads of gore from their bruised lips and cheeks. The video becomes a physical representation of emotional damage and disarray. Behind the smiling faces are lovers scorned and blinded by a voracious yearning for colorful, captivating love. Yet their quest falls short at the hands of a tempting but volatile love, leaving them bruised and bloodied. Animal Eyes doesn’t settle for subtlety in “Guava.” Instead, they turn one of life’s hardest lessons into a tangible, disquieting portrait. The video itself blends elements of chaos and humor, creating a story that’s almost impossible to look away from. “Guava is a fast paced bizarre visual trip that represents the wild pulverizing nature of young love. The music video captures everything new relationships experience in one ridiculous, crazy, exciting, colorful, and psychedelic display,” says Kat Audick, who directed and produced the video. Animal Eyes efficaciously crafts “Guava” as a song of turmoil and shameless passion, equipped with an infectious melody that sends us all on a trippy, electrifying, and fast-paced, tail-spin journey through the ebbs and flows of young love. Danielle is an Atlanta native with a love for electronic music, R&B, and Chick-fil-A biscuits. While ATL remains her first love, she spends her summer weekends making friends at music festivals and live shows along the east coast.